Announced in a press release, the QR code-based system lets customers provision Target REDcards on their device, which can be used in conjunction with digital savings like Cartwheel offers and Weekly Ad coupons at checkout. According to the company, Wallet is up to four times faster than other in-store payment types. Which payment systems were tested as part of Target's impromptu study is unknown. 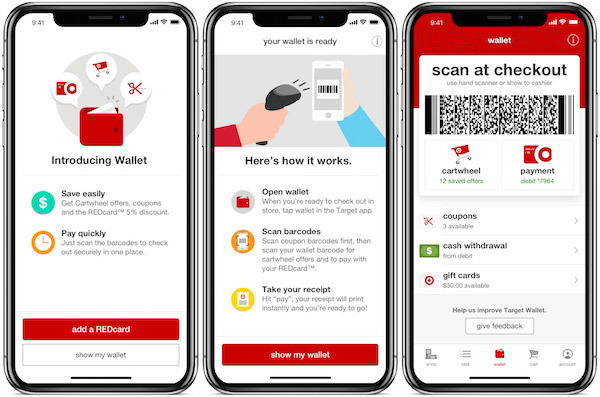 "Wallet in the Target app makes checkout easier and faster than ever," said Mike McNamara, chief information and digital officer at Target. "Guests are going to love the convenience of having payment, Cartwheel offers, Weekly Ad coupons and GiftCards all in one place with Wallet." Unlike NFC-based solutions like Apple Pay, Target's Wallet relies on generated QR codes that can be scanned at a point-of-sale terminal. To pay, users are instructed to open the app, tap on "Wallet," scan coupon barcodes with an iPhone's camera, scan their Wallet barcode at the POS terminal for Cartwheel offers, then press "Pay." Provided screenshots also show options to make cash withdrawals from an associated debit card and apply gift card credit, but those features were left unmentioned in today's release. Target is the latest big-box chain to roll out an in-house payments solution instead of adopting existing technologies like Apple Pay. Walmart, another Apple Pay holdout, debuted the QR code-based Walmart Pay to all U.S. stores last year. It was Target and Walmart that led the charge against Apple Pay implementation in favor of in-house technology developed by the Merchant Customer Exchange consortium, of which both companies are founding members. Dubbed CurrentC, the mobile payments solution was touted as a segment competitor by MCX until the pilot program fizzled out last June. MCX subsequently sold the defunct platform to JPMorgan Chase earlier this year. Earlier this year, a Target customer service representative gave Apple device owners false hope in a tweet saying the retailer was working to integrate Apple Pay in its stores. Target quickly denied the claims, noting it had no plans to make Apple Pay available beyond in-app purchases. Those interested in taking advantage of Target's Wallet technology can download the company's app from the iOS App Store.